It's a fine day here in the Serengeti. The repetitious cooing of the ring-necked doves is piping down as the heat of the day comes up. It won't be too hot today, for the cloud cover is a cooling silvery gray. I'm looking out over a soda lake ringed by graceful flat-topped acacias. Its glassy waters reflect bands of trees and sky and a thin pink line of flamingos feeds near the far shore. Beyond, on the treeless flats stretching off toward Naabi Hill, a mass of black dots mutes the green of the plain. When I raise my binoculars, the black mass sharpens into the individual shapes of wildebeest, thousands of them. Yesterday I stood on Naabi Hill looking down on "the migration." From the Simba Kopjes to the Gol, flowing out past the woodlands and swamps of Ndutu to Three Trees, the black columns are on the move. It is a sight that never fails to excite me. The ungainly wildebeest, or gnu, with its big bearded head, humped shoulder and too-short hindquarters, could be a beast designed by a committee. But although the individual is comic, the mass aggregations of tens or even hundreds of thousands covering the plains are simply beautiful. 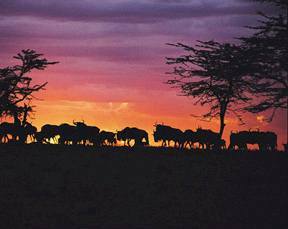 There is nothing more dramatic in nature than this migration of Serengeti wildebeest. It's not is not the animals alone that are so profoundly affecting. It is also the landscape. Its elemental simplicity imparts a powerful sense of freedom to the imagination. The Serengeti is a great undulating sea of grass, punctuated by kopjes, islands of sensuously rounded rock outcrops, bordered only by horizons where the prairie just rolls over the edge of the earth into a boundless sky. 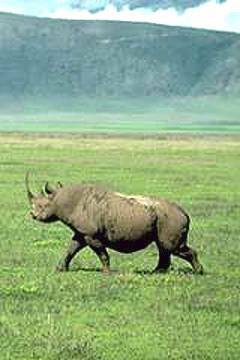 To cross the plain surrounded by impossible throngs of free-living animals is the quintessential African experience. More than one and a half million wildebeest live here, as do almost a half million zebra and a million gazelles. The very size of the herds goes beyond the quantitative with wild animals as far as the eye can see. Where else can that be found? Such a sight is gone now from the plains of Asia and North America gone now even from most of Africa. It is only here that such herds still roam completely free, a timeless remnant of the abundance of unfettered Nature, of a world unbound by omnipresent Man. 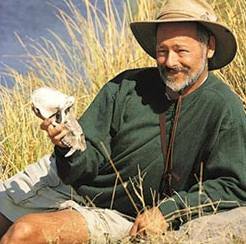 As Director of Operations for over twenty years, Alan Bechky designed most of Mountain Travel Sobeks outstanding safaris, and led many of them. Now, Allen devotes his expertise to developing and guiding Allen Bechky Safaris, operated in association with Mountain Travel Sobek. Allens safaris are geared for serious natural history enthusiasts who are passionate about wildlife observation and seek an intensive field experience. Each is a unique, carefully crafted expedition that fully explores one of the planets premier wildlife havens. On safari with Allen, youll target the very best wildlife areas and maximize your time in the field: you work hard, see more wildlife, and come away with a far better understanding of the animals and their habitats. Allen is the author of Adventuring in East Africa, a comprehensive guide to traveling in East Africa, and Adventuring in Southern Africa, a companion book on safaris in southern Africa. The Masai call the Serengeti the "empty place" but on this safari you'll find it anything but empty. With Allen, you'll explore the secret places of the Serengeti on an extended sojourn in this kingdom of predators. Discover hidden gorges (Masai cattle rustlers' hide-outs) in the Gol Mountains, the crocodile pools of Kirawira, the haunts of black rhino in the Moru Kopjes, the cheetahs of the Gol Kopjes, the lion prides and leopards of Seronera, the elephant herds of Ndutu, and the thundering herds of the Great Migration, when wildebeest, zebra, and gazelle cover the plains in countless numbers. Allen rates the Serengeti as Africa's greatest wildlife destination, and these trips are scheduled at his favorite times to be there: when the countryside is beautifully green, and the plains are filled with animals yet absent of tourists. On this safari you will see more wildlife than you ever dreamed existed. For more information on Allen Bechky and his safari program, please visit Allen Bechky's Safaris.